I was totally in my comfort zone. That’s not necessarily a good thing. 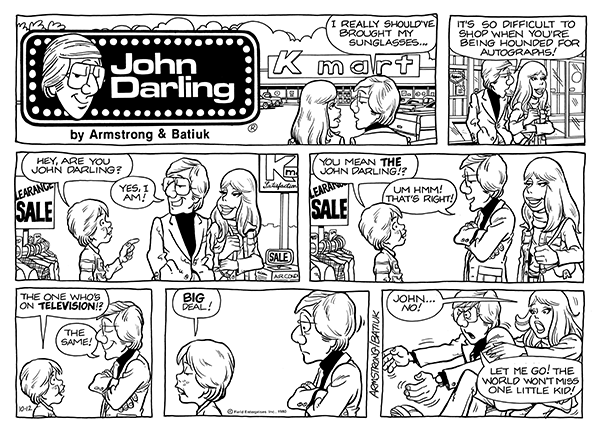 As 1981 dawned, the new year found me deftly dealing with the dual deadlines of both Funky and John Darling, and, even though I was still a Swiss army knife doing everything but the art on John Darling, I was finally able to lean back a little and enjoy myself. I had completed the process of trying to assimilate my various influences, screwed it up, and was now left with the finished product, my style. It was a freewheeling, wide-open style that for the moment was serving me quite well. I had put in my 10,000 hours (I always wonder how that came out to such an even number) learning my craft and was now getting a chance to put those lessons to good use as I played with my characters for the amusement of my readers. I’m fully aware that hindsight is affording me a rather rosy view of that time and that deadlines once met are deadlines forgotten; nevertheless, I had rounded my learning curve and was happily cruising down the straightaway at the wheel of a pretty smooth-running machine. Which meant, of course, that I was about to enter the most dangerous territory of all. Not much more to add about the Akron Comicon from previous posts except to say that, if you enjoy a comic con that’s actually focuses on comics and comic artists, this is the place to be. While I’m at the Buckeye Book fair on Saturday the 4th, my wife Cathy and son Brian will be holding down the fort with signed Lisa’s Trilogy books and other goodies. Then I’ll be there all day on Sunday to sign and greet and chat and take pix of your cool costumes. This will be one of the last chances to pick up a signed copies of the new books and say hello before I hunker down for the winter to concentrate on my side job creating Funky and Crankshaft. Hope to see you there and happy comic book hunting.